When a dental crown is placed on a tooth, it is meant to provide permanent protection. 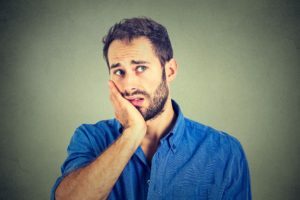 With proper care, your restoration will serve you well for many years, keeping your tooth safe while allowing you to bite and chew normally. If you have a problem with your dental crown, you should reach out to your dentist as soon as possible for care. If your restoration is loose, damaged, or lost, it puts your tooth in jeopardy. By attending regular dental checkups, your dentist is able to monitor the condition of your crown. If it looks like it needs to be replaced, they can let you know, and you can arrange this before the crown suffers real damage. Our teeth will not recovery after a cavity, or significant damage. Dental restorations are meant to provide permanent support, making it possible to protect the tooth, and keep your smile attractive. Unfortunately, a restoration, like our natural teeth, can suffer damage, and require replacement. Regular dental checkups give your dentist the opportunity to review your smile for any potential problems. They will look for signs of decay, evidence of gum disease, and many other possible concerns. If you have a dental crown, or a dental filling, they can also take the time to perform an examination and make sure they are in good condition. Early detection for any dental concern, including concerns about restorative work, can lead to less risk for your oral health, and earlier treatment. If you think something may be wrong with your dental crown, reach out to Wager-Evans Dental. You can receive the necessary care to make sure your tooth maintains the support it needs. Our comprehensive dental office can provide you with the care you need to ensure your oral health stays in the best possible shape. Located in Reno, NV, we are proud to welcome residents from South Meadows, Double Diamond, Caughlin Ranch, Donner Springs, Meadowood, Sommersett, Arrow Creek, and all other nearby communities. To schedule an appointment, visit our office, or contact us today by calling (775) 829-7700.